It’s time for another movie review presented by our good friends over at FatCats Gilbert on Greenfield and Baseline! FatCats Gilbert is the best place to catch up on all of the latest summer movies like Dunkirk, Spider-Man: Homecoming, and Valerian and the City of a Thousand Planets! The best part about FatCats Gilbert, aside from Recline-N-Dine seats that make you feel right at home, is that it’s only $5 to check out a movie on Tuesdays! To see showtimes, you can click right HERE! The summer is almost over, but it looks like we’re going to squeeze out one more blockbuster with The Dark Tower. To be honest, I’ve never read the books for The Dark Tower. While I enjoy a lot of movies based on Stephen King’s novels, I’m not familiar with the story of The Dark Tower. I thought the trailers were alright, but I didn’t find them too special. The main selling points, for me, were Idris Elba, Matthew McConaughey, and the fact that this is a Stephen King story. Let’s talk about the movie! The Dark Tower is directed by Nikolaj Arcel and stars Idris Elba, Matthew McConaughey, and Tom Taylor. For many years, The Dark Tower has been the only thing keeping darkness and fire out of all of the land, but if it were to fall, evil would rule. 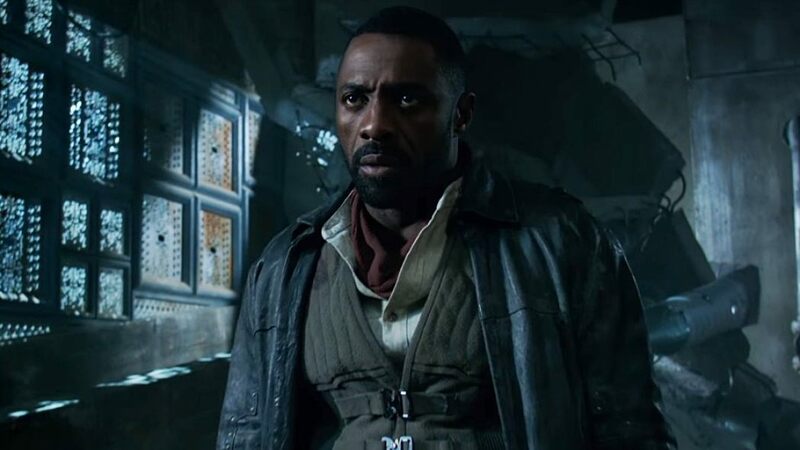 The final Gunslinger, played by Idris Elba, must take on the Man in Black, played by Matthew McConaughey, to protect it, and alongside Jake Chambers, a boy who is more powerful than he knows, he has a chance to end the threat against good. To get my overall thoughts on the table right away, I don’t think that this is a great movie. Heck, I don’t even think it’s that good of a movie. However, I do think the there is a lot to like about it, so let’s start there. First of all, one of my main points of attraction to this film was the Stephen King story and mythology. The story, at its core, is great. It’s very imaginative, it builds this wondrous world where magic and practicality can come face-to-face, and the characters have very interesting individual stories. Idris Elba and Matthew McConaughey are both great in their roles. As far as what the movie does with the roles, I have a few issues, but the characters themselves are very interesting, and I thought that Elba and McConaughey were a great match for each other. The Gunslinger, in particular, has a plenty of layers that Elba gets to reveal, and I always love the idea of a beaten and battered hero. In this movie we never have the state of equilibrium that most stories start with, and I liked that there have been many issues for our characters to face before we were introduced to them. I also thought that the young boy, Tom Taylor, was great. He plays the conventional young-adult genre chosen one, but he was still able to bring a sense of wonder and knowledge to the role. Though I love the story of The Dark Tower as well as what it entails, I was really disappointed with how it was presented. Other than the entertainment factor, the good performances, and the great visual effects, it wasn’t given much life or depth. I wasn’t emotionally attached to much, even if certain relationships played a large role on-screen. I never felt as though they were written or directed with life and love. A lot of the story feels rushed, and though it’s great by itself, it’s missing so much. Though I haven’t read the books, I can only assume that this is what happens when you translate 9 Stephen-King-length novels into a 95 minute-long film. There are certain movies that deserve to be short, and work perfectly at 90 minutes. For example, Despicable Me 3 was a perfect length at just 90 minutes. The Wall from earlier this year was just over 80 minutes long. For those films, those are the perfect lengths. For The Dark Tower, I could see it being two hours or maybe even longer just because of everything it needed to include to feel like it fed my appetite for depth. There just isn’t enough here to give me what I want whether the issue lies with unanswered questions, great pieces of depth that are never fully realized, or relationships and stories that are not fleshed out. Overall, The Dark Tower is entertaining and interesting to an extent, but it’s really nothing special. It’s probably not a movie that I would be jumping out of my shoes to send anyone out to see because if you’re just looking to check out a summer blockbuster, it’s not entertaining enough to forgive all of the interesting things that it forgets about. If it returned to those and went into depth on those topics, it might have been worth checking out. The same goes if you’re a fan of the novels. I can’t see The Dark Tower satisfying anyone hoping to milk every last ounce of information out of the books into the bucket that is this movie. It’s just not possible, but I probably could have told you that before even walking into the film. I probably could have said that 95 minutes of film, including credits and opening, won’t do justice to 4,570 pages of story. Yes, I did the math for anyone wondering if that’s accurate. I’m going to give The Dark Tower a 5/10. Will you be checking out The Dark Tower? Comment down in the comment section and let me know! As always, thank you, and keep listening to 88.7 The Pulse!